Today’s guest post is by Carley Clement. Making the decision to volunteer abroad is both an exciting and intimidating one. You’re excited to use your passions and skills to give back to communities, but with the growing number of international volunteer abroad organizations out there, you probably have no idea where to start. 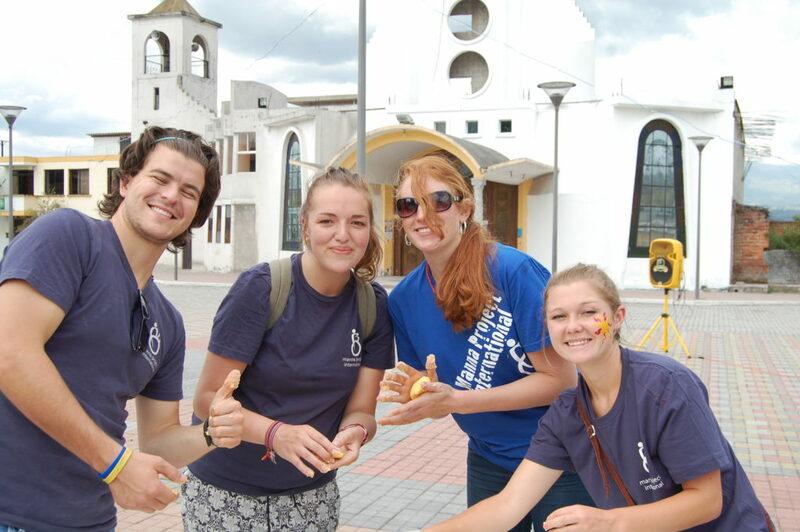 For the past two years, I have worked in Ecuador with Manna Project International. During that time, I met volunteers who thrived in various volunteer placements, and others who wished they had done a little bit more research before taking the plunge. You can’t get what you want out of an experience abroad if you don’t know what it is that you want in the first place! Spend some time thinking about your priorities, and make a list if that’s the way you process things. Do you want to grow your language skills? Are there specific aspects of non-profit management or other professional skills you’d like to grow in or experience for the first time? Once you know what you want you will have a much easier time determining which organization is right for you. If you want to learn a second language, make sure you find a program that includes classes at a local language school, and puts emphasis on spending time in homestays or with community members. If you’re interested in gaining specific skills or working on a specific type of program, make sure the organization places a focus on that program above others; connections with local partner organizations in this area can also show a strong commitment to this area of work. Time volunteering abroad is about benefiting an under-served community, but you’ll also want to make sure the experience is beneficial for you. The importance of location applies as much to choosing the right country as choosing the right place within that country. Cities can be energizing and exciting, but if your priority is immersing yourself in a new culture it might be better to choose a small town or more rural environment. However, if you want the flexibility to travel during your time off, it might be easier to work at a volunteer placement in a larger city, or in a region that has easy access to cheap public transport. You wouldn’t want to arrive abroad ready to work in a medical clinic only to find out you’ll be spending your days doing administrative work! Make sure you ask the volunteer coordinator about what your average day on the job would look like before you make a commitment to the organization. It can be a challenge sometimes to pin down an average day, as working abroad as a volunteer will often include unforeseen opportunities and challenges, but ask the volunteer coordinator to approximate the percentages of time you’ll spend on each task. If you can talk to a former volunteer about this, even better! It’s also important to make sure you have an idea of what your average day will be like when you’re not working on your volunteer projects. Will you be living in a homestay, or with other volunteers? Will you be cooking for yourself? Will you have downtime to travel or explore other interests? These factors may seem like minor details now, but they will make a big difference in your experience overall. They can mean the difference between getting immersed in a culture or just skimming the surface, throwing you way too far outside your comfort zone or providing the support you need to thrive. Does the placement organization have an up-to-date website? Can you find evidence of satisfied partner organizations or support from the local community? Can you find independent, positive reviews from past volunteers? If not, you may want to move on. Volunteering abroad is often a big investment of both time and money, and you don’t want to arrive in-country only to find that the organization isn’t sustainable, doesn’t have any support in the local community, or just isn’t what it says it is. This involves plenty of research on your end. Don’t just rely on the organization’s website – do some digging and see what else you can find online. Reviews by former volunteers will help you determine if the volunteer experience is all it’s chalked up to be. Reviews or partnerships with volunteer placement organizations like Omprakash, GoOverseas, or Volunteer Forever show that the organization is well-respected and has a strong history to receiving volunteers and providing them with a good experience. If you’re interested in seeing if the organization is sustainable, see if it has a listing on GuideStar or Charity Navigator to see it’s financial standing, how much of its funds go to programs that benefit the community, and more. Doing your research beforehand might seem tedious, but it will help you find the best placement for you, and one where your impact as a volunteer will be felt long after you head home. Talking to current or former volunteers will help you determine if the organization is all it claims to be, and if it’s what you’re looking for. Ask the volunteer coordinator to put you in contact with at least one current or former volunteer that would be willing to have a Skype call with you before you make a commitment to the organization. During my time volunteering abroad with Manna Project, I have been part of the interview process for many new volunteers. Time and time again they say how much they appreciate being able to talk to someone who has already been through the experiences they’re considering having for themselves. Whereas a volunteer coordinator or other staff member may have more years of experience working with the organization, they won’t be able to tell you what it’s like to work with an organization as a volunteer unless they’ve done it for themselves! If you’re not sure yet, start small. You’d rather commit to shorter experience and then want to come back for more later than commit to staying abroad for a year and realizing 2 months in the experience just isn’t for you. There are plenty of organizations that offer short-term trips of a week, a month, two months, and everything between. Before I committed to staying with Manna Project in Ecuador for two years, I spent a summer in Colombia working with a similar organization. If you are able to, this can be a great preview into a longer placement, and will give you confidence before your next experience abroad and about your next volunteer abroad placement. Author Bio: After graduating from NYU in May of 2014, Carley Clement followed her passion for Latin America to Sangolqui, Ecuador. She currently works for the nonprofit Manna Project International as Senior Program Director, and spends her free time cooking Cuban food, traveling, and playing with street dogs. Follow Carley on her blog, on Twitter and Instagram.